There I was Friday afternoon, sitting in my standard windowless corporate office, doing my standard office work , when I discovered that my phone was buzzing in my pocket! 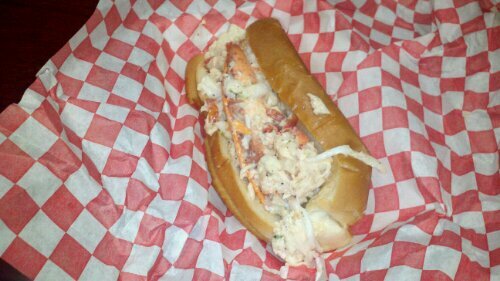 Just like Pavlov’s dog, I started salivating because I had gotten a tweet from one of my fellow foodies that the “Lobsta Truck” was en route with their yummy lobsta rolls. Two minutes later a text arrived…..”The Lobsta has landed”. This text was my queue to send a series of tweets to my followers, “the chair is against the wall, the Lobsta has landed”. For those of you familiar with the French resistance during WW 2, you might know that this was the code word the French Resistance received to indicate that D-Day was about to begin and to assemble their forces to support the Allies Beach landing. messages, texts and good old fashion phone calls. 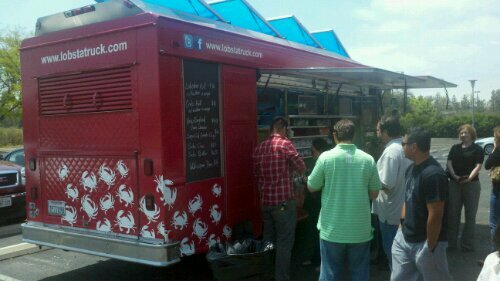 What is the result of the “The Lobsta Trucks” keen use of social media? There was already a 50 person line when I arrived at 11:20 and by 11:30, the official start time, there were another 50+ people behind me. 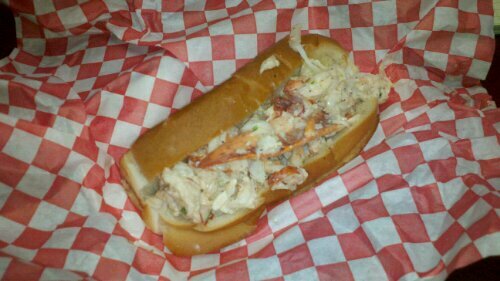 The menu is very basic, but tasty, a) lobster rolls with mayo or butter dressing b) snow crab roll with mayo or butter dressing, clam chowder c)New England style clam chowder. Based on the conversations I had with fellow foodistas in line, the owner made a trip to Maine and fell in love with the lobster roll shacks littered all over the state. Apparently Seattle has coffee shacks, Portland has hipster shacks, Philly has cheese steak shacks and so Maine has the lobster shack……me personally…I run a love shack, but that’s an entirely different blog. has a nice golden brown toast. The contents of the sandwich was pretty much all Lobster, aside from the mayo dressing. The lobster meat appeared to be all shucked from a lobster (real lobster). The meat came in nice big chunks of lobster, including a very large segment from the claw. The Mayo dressing was a combination of mayo, bay seasoning, garlic and salt. There appeared to possibly be a few pieces of cabbage and carrot (but not very much). When I took a very large bite of the Lobster roll, the bread was soft and the toasted roll was slightly crispy on the tounge. The Lobster itself was soft as I bit through it, indicating that it was not overcooked. The taste was sweet and I instantly became giddy as a school girl discovering Justin Beiber was visiting my school. Needless to say, I ate the entire lobster roll in less than 5 minutes. Upcoming Event: Palm Desert Food and Wine Festival! 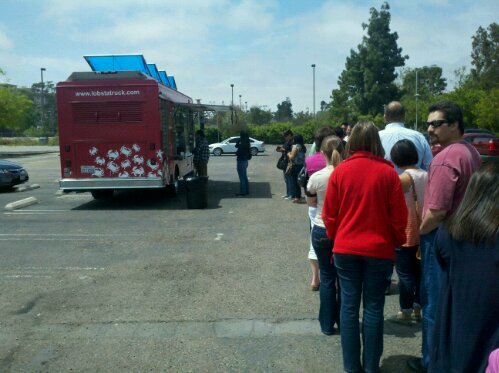 Review of Home Skillet Truck – Setting the Standard for Food Trucks! Los Angeles Travel and Adventure Show is for Foodies Too! “The Winery” Restuarant – Best Restaurant in The O.C? Tom’s Cameo in Man Versus Food with Adam Richman -> look for Tom in the Pig costume! New Product Spotlight and Contest: “B. Toffee”, Seriously Good Toffee! Review of “The Bungalow” in Corona Del Mar – Does this revered restaurant still live up to it’s name? Review of “Tasting Spoon” Truck -Former Ritz Carlton Exec Chef Goes Food Trucking!